This is a journal of Postcards of London. The postcards I have included were amongst a box of over 60 years of postcards collected by members of my family. 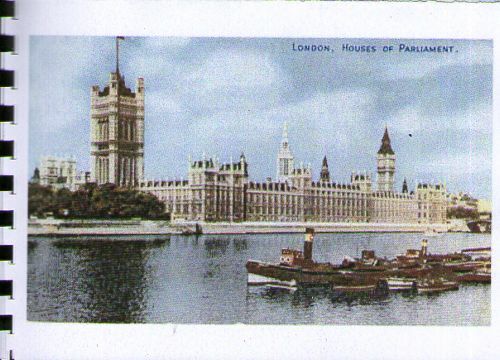 Perhaps because I lived in London for over a quarter of a century, I have fewer postcards of London than any of the other places I am making PC journals about! So this one is a bit different. You can write, draw or comment on any of the postcards included but more than with the others I would like to encourage, you to insert a postcard of your own – if you have one or two you wish to include. Use the page facing the postcard if you want to write about it or just add ones you like. From time to time I will mooch it back. This is an altered book with the theme of emotions. Each person will contribute to the book. It may be turned into a ‘zine after it comes home. This journal was created in January 2009, mooched twice and then lost without having been listed here. It has now been recovered and is now back in circulation.